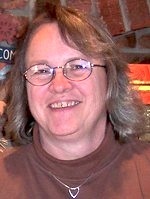 Edna Gayle (Saddler) Jenkins, 68, of Spring Hill, KS passed away April 12, 2017 at her home. Graveside service will be at 10:00 am on Tuesday, April 18th, 2017 at Spring Hill Cemetery, Spring Hill, KS. Visitation will be 6:00 pm to 8:00 pm Monday, April 17th, 2017 at Bruce Funeral Home, 712 S Webster, Spring Hill, KS 66083 913-592-2244. Memorial contributions may be made to St. Jude Children’s Research Hospital or Ronald McDonald House Charities of Kansas City, Inc.
Gayle was born June 29th, 1948 in Cherry Lane, NC to Varden and Nonnie (Williams) Saddler. As a young child, she and her family moved to Kansas City, MO, where she later graduated from East High School. Gayle has been a part of the Spring Hill community for 40 years. She worked for Honeywell as a Display Technician for over 35 years. Gayle enjoyed doing genealogy and spending time with her family. She will be dearly missed by family and friends. Gayle was preceded in death by her parents; brother, Roy Lee Saddler and an infant brother. She is survived by her sons, Richard Scott Reasoner of Spring Hill, KS, Jeffrey Allen Kirk Reasoner and wife Dory of Stilwell, KS; daughter, Amanda Gayle Stiles of Olathe, KS; siblings: James Durean Saddler of Albany, MO, Patricia Ann Winger of Glade Valley, NC, Jerry Wayne Saddler of Sparta, NC, Judy Carol Wyman of Independence, MO, Johnny Emerson Saddler of Independence, MO; and 4 grandchildren; Corey, Rebecca, Kennedie, and Mia.